No fooling, April 1st is the first ride of our Spring 2013 Season! I will send out GO / STOP status before 8:00 AM Monday morning. BTW, everyone is invited to join us for Lunch at Via Lago after the morning ride, and/or before the afternoon ride. We wouldn't want to get too healthy now, would we? 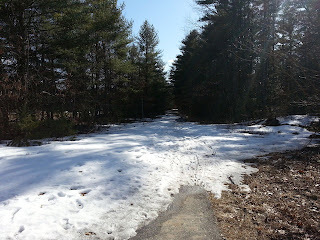 This is what the rail trail in Groton looked like at Sand Hill Road yesterday. Good thing we are going to Lexington! Helmet - REQUIRED. Gloves are a good idea too. Bicycle in Good Working Order. PROPERLY INFLATED TIRES. If you are having trouble, come a few minutes early and I will help you. This is surprisingly important! Required - Your Smiling Face. If you want to print out a copy of our Waiver and initial the yellow boxes and sign at the bottom, it will save us some time at the start. Otherwise I will have copies for you to sign. The weather forecast is for mid 40s, Partly Cloudy, and breezy in the morning. In the afternoon it should be low 50s, Mostly Sunny, and getting windy. Dress in layers accordingly. The morning Recreation ride will head south on the Minuteman Bikeway to Arlington with stops at Spy Pond and Magnolia Park. 9:30 AM - We will leave for Arlington. Starting Point Map - Lexington Center - Pay Parking Lot. Route Map - Lexington - Arlington. Equipment - I plan to bring my hybrid bike. AR Index - Roughly equal to 14 flat, smooth miles. LUNCH - Via Lago in Lexington Center. The afternoon Beginner ride will head north on the Minuteman Bikeway to Bedford with an optional side trip to the Narrow Gauge Rail Trail. 12:30 PM - We will leave for Bedford. Route Map - Lexington - Bedford. AR Index - Roughly equal to 9 flat, smooth miles.